Deal: Deep discounts on women’s and men’s apparel. Deal: Up to 95% off retail prices of retired and gently used dresses and accessories from Badgley Mischka, Shoshanna, Nicole Miller, and many more. Deal: Up to 70% off evening and cocktail wear. Deal: Up to 75% off hand-knotted rugs, including designer rugs from Missoni and more, Tibetan rugs, and one-of-a-kind pieces. Deal: Up to 75% off women’s accessories, including hobos, clutches, totes, iPad cases, and wallets. Deal: 50% to 75% off lingerie and intimates. Deal: Deep discounts on jewelry, starting at up to 70% off. Select pieces will be 2 for $5, and $1 each when you buy 20 pieces or more. Deal: Shop a wide selection of samples for men and women from the fall and summer collections. Deal: Up to 70% off designer bridal gowns, with sample gowns starting at $699 and accessories starting at $99. Brands include Pnina Tornai, Jimmy Choo, Mark Zunino, Isaac Mizrahi, Badgley Mischka, and more. Sizes 6 through 28 are available. No appointment necessary. Deal: Markdowns on scarves, priced between $10-$60. Deal: Discounts on cashmere, including the iconic travel wrap for $150, the INtarsia sweater from the Urban Adventure collection (starting at $100), and accessories starting at $50. Deal: 30% to 70% off designer furniture and home goods, including items from Atlantico, Autoban, Matthew Hilton, Benjamin Hubert, Leif.designpark, neri&hu, Søren Rose, and Studioilse. Deal: All shoes are $30. Cash Only. Up to 80% off OUterwear, Daywear, Evening, Sportswear. All sizes available, huge selection, try on permitted. All sales final, credit cards accepted. No children, no strollers. Deal: Deals on men’ and women’s clothing, footwear, and accessories. Polos are $40 to $60 (four or more at $30/each), sweaters are $60 to $120 (or three or more for an extra 20% off), and outerwear is $80 to $350. Deal: 60% to 80% off Fenton and Fallon jewelry. $100 credit card minimum. Deal: Up to 80% off women’s, men’s & kid’s apparel. Stock and sample merchandise will be available in all sizes. Sleeveless dress with red and black plaid with rose detail will be $45 (from $200), and men’s color-blocked V-neck sweaters with the Desigual logo will be $50 (from $139). Deal: Up to 75% off ready-to-wear and gently used samples. The cropped Suede Addison leggings are $250 (from $995), and the Matelassé Abigail blazer is $134 (from $495). Deal: 65% to 85% off women’s ready-to-wear. Deal: 60%, 70%, and 80% off women’s ready to wear. Deal: Up to 70% off home goods and furniture. Discounted items include the JA Lacquer tray for $95 (originally $175), the Preston Cocktail table for $450 (originally $1495) and the Utopia mugs for $10. Delivery will be available for a separate cash charge. When/Where: Friday, October 18 through Saturday, October 19. Daily 10am—5pm. 513 Irving Ave at Eldert St, Brooklyn (no phone). Deal: 60% to 95% off new and gently used women’s designer clothing, jewelry, shoes, and handbags. Designers include Alexander McQueen, Chanel, Céline, A.P.C., Stella McCartney, Mui Mui, and more. All proceeds from the sale benefit JCP’s educational and community programming. New inventory will be featured each day. Deal: Deep discounts on underwear and intimates. Deal: Markdowns on women’s clothing, shoes, handbags, belts, small leather goods, jewelry, sunglasses, and fragrances. The sale will also include a small selection of men’s clothing, shoes, belts, and small leather goods. Deal: Up to 55% off beauty products and makeup, including moisturizer, mascara, nail lacquer, eye pencil, lip gloss, brow pencils, and more. Deal: Up to 80% off women’s, men’s and children’s clothing and accessories. The Veda leopard blazer will be $190 (from $770), and the Mark Maille peacoat will be $250 (from 630). Deal: Up to 60% off children’s clothing for girls and boys from newborn to preteen. The sale will also include sleepwear, outerwear, shoes, and accessories. Deal: Up to 70% off select shoe styles, including women’s flats, heels, wedges, boots, and more. The Highland boot in camel and the Dylan bootie in Moss are both $73 (from $244 each). Deal: Discounts on luxe apparel and accessories. Deal: Up to 60% off jewelry, including the designer’s iconic cable collection. Deal: Up to 65% off women’s jewelry. 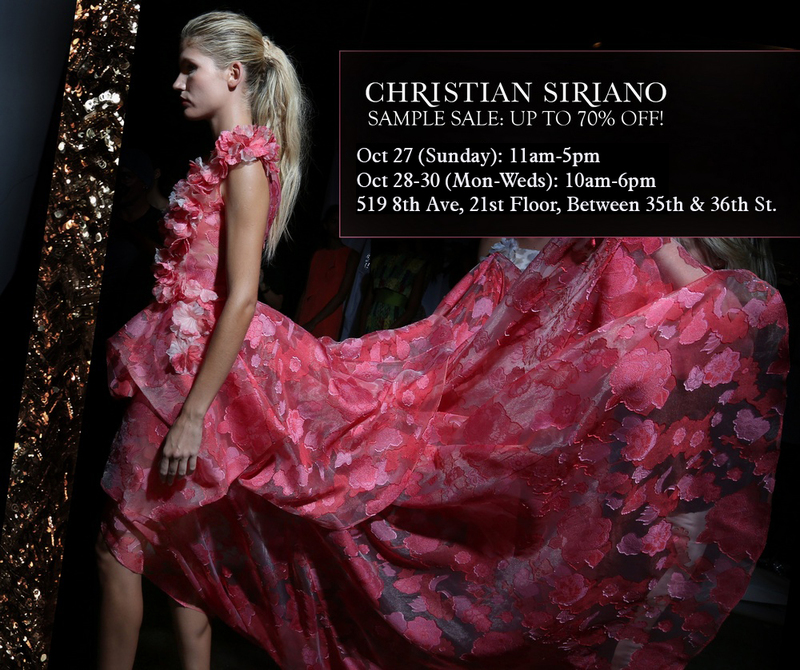 Christian Siriano Sample Sale: Up to 70% OFF! Deal: Deep discounts on men’s and women’s clothing and accessories, including stock and samples. Tucker: Discounts on women’s ready-to-wear, including coats, jumpsuits, and classic pieces.